Before the demise of a Perfect Fakir, he grants succession to his appointed disciples. Among them, only one is the superior spiritual successor (khalifa-e-akbar) whereas the rest are junior spiritual successors (khalifa-e-asghar). The superior spiritual successor is the real spiritual heir of the Perfect Fakir and the leader of the spiritual order. The Perfect Fakir trains his spiritual heir himself and gives him responsibilities. After the Perfect Fakir, he would call people towards to the path of Allah. Fakir does not ask Allah of anything except Allah Himself. He is only desirous of the vision, closeness and pleasure of Allah. Hence, his attention is solely towards Allah. Despite staying in this world, he does not drown in its quicksand. He gives the same lesson to his followers. Because the Perfect Fakir is the exact reflection of his Murshid, this is why his khanqah is similar to the khanqah of Saints. The people of khanqah get training according to the teachings of Islam. The seekers of Allah learn to gain the closeness and vision of Allah. Though it is upto the disciple that how much of the Murshids company does he acquire to get his beneficence. 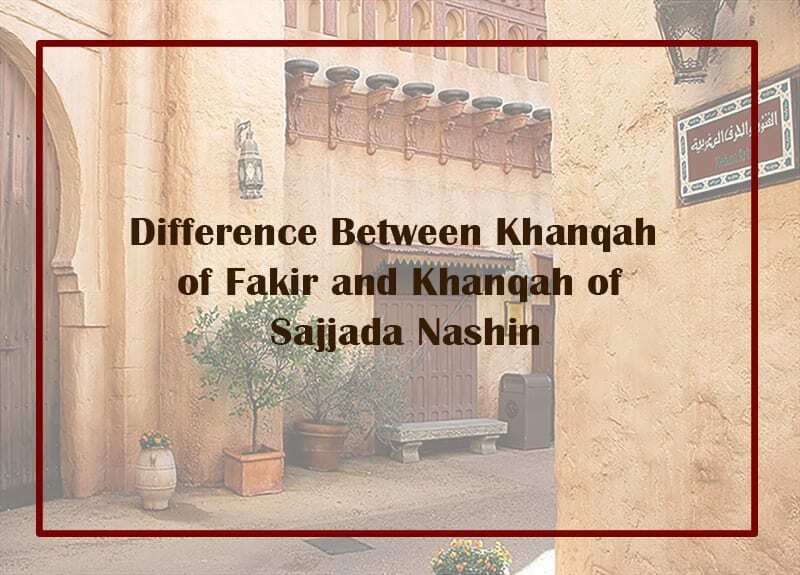 The khanqah of Fakir is the place where the method to get vision of Allah and presence if the Mohammadan Assembly is taught. Khanqah is the centre of training for the seekers of Allah where thye acquire the company of Murshid. Through the invocation (dhikr) and contemplation (tasawur) of personal name of Allah (Ism-e-Allah Zaat), their innerself is purified. Through the cleansing of soul get the closeness of Allah. “(This Light of Allah illumines) such houses as Allah has ordained to exalt (i.e., enhance their esteem and honour) and remember His Name therein. (These are the houses) in which (Allah’s servants) glorify Him morning and evening. Education and training by the company of Murshid within the khanqah, gradually makes one a dervish. The system of khanqah was initiated since the time of Prophet Mohammad pbuh. The people of Suffa would disconnect themselves with the rest of their world. They would spend all their time on a raised platform in the company of their Murshid, the Holy Prophet pbuh. However, later Saints built a proper foundation for khanqah when other institutions failed to fulfill the spiritual needs of the seekers of Allah. At the time of Prophet Mohammad pbuh and his sacred caliphs, the madrassas or religious centres stood for both for physical and spiritual religious education. Unfortunately, this system deteriorated. The Saints then decided to build khanqahs for the spiritual education of the masses. In the Indo-Pak Subcontinent, many khanqahs existed which is why there was less focus on materialism. Gradually, the distance between Muslims and their khanqahs lengthened. Other non-Muslim nations took advantage and invaded their khanqahs while rendering the Muslim religiosity with merely physical worship and differences of sects. On the other hand, the lack of religiousness and urge towards the world among people made the Saints hide themselves away. The disunion, prevalent among the young generation is from those educational institutions which do not teach about spiritualism. The British ruined the ancient system of khanqah among Muslim setup by changing the law of inheritance. The lawful heir after the demise of a Shaikh was changed from the real spiritual heir who is the Perfect Fakir to the biological son regardless of him being worthy of it or not. Even if a Saint, during his lifetime, appoints his spiritual heir as the shrine custodian (sajjada nashin) of his shrine, the court dismisses him from this position and hands over the shrine as well as the khanqah to his biological son. It is not necessary that the son, appointed as the shrine custodian, is also the spiritual heir of the Shaikh. It is only their good fortune that they are born in the sacred house of the Saint. These days the shrine custodians murder their Muslim brothers only to take control upon the shrine and khanqah for the property, wealth and income generated out of it. This is also another way to enter politics because the number of disciples results in the increased number of votes. However, in the holy world of spirituality and mysticism, shrine caretaking holds no significant value. Even the shrine taker is not a very grand status. Consequently, the government often takes charge and control of the shrines and related khanqahs when their caretaker fails to look after them properly. Such so called ‘shrine caretakers’ are also responsible for those who have given up on their belief upon Saints. Many people who mistook shrine custodians as Saint have lost belief that any Perfect Saint exists in this era. Many people have been subject to sheer disappointment on discovering that the shrine caretakers had no spiritual powers. However, this does not imply that the progeny is never worthy of the being the heir of Faqr. Infact, sometimes the progeny is more deserving than any other disciple is. Sultan-ul-Ashiqeen Sultan Mohammad Najib-ur-Rehman elaborates this couplet of Iqbal. He says that the dwelling of eagles (exalted Saints) where hearts were illuminated with the light of faith, are now under the encroach of crows (fake Saints). In heritance, the sons of Saints have adorned the throne of spiritual guidance and persuasion of the perfect spiritual guide which in truth only Prophet Mohammad pbuh grants. They use it out of the greed for offerings of devotees and to establish goodwill for political purposes. The seekers of the world whose inwards are empty of Allah’s love and filled with greed of the world have in their clutches the Khanqah of the Universal Divine Man. The same khanqahs which were a home to seekers of Allah and where the Saints used to enlighten their inwards. Prophet Christ’s attribute was ‘Rise by Allah’s command’ ( قُمْ بِاِذْنِ اللّٰہِ ). When he used to recite this, it would bring the dead back to life. In these couplets, Iqbal says that those Perfect Fakirs who used to enliven dead hearts with the light of faith have now become rare. The shrines (mazars and dargahs) and connected khanqahs now belong to those shrine caretakers who had a Saint among their forefathers or by those who got the throne of guidance in inheritance without struggling for it. Such people do trade of shrines without knowing the glory of the Saint. As a result, many people have become restless as peace lies only in spirituality. It is not necessary for a Fakir to be a shrine caretaker of a shrine. However, it is incumbent upon him to build a khanqah for the guidance of people towards the path of Allah. Also, it is obligatory upon him to bless seekers of Allah with his company. Also, to grant beneficence and spiritually elevate them after purgation of their innerself. Moreover, to train preachers for the true faith similar to the practice of the Holy Prophet pubh. The shrine caretakers of today are also included in this. History is witness to the fact that none of the most elevated, revered and popular Saints were shrine caretakers. They earned their respect and honor through their own effort and struggle in the way of Allah. According to Sultan Bahoo RA, the genuine Fakir is the one who does not rely upon shrine caretaking and makes name for himself. Many of the renowned Saints such as Shaikh Abdul Qadir Jilani RA, Data Ganj Baksh RA, Khawaja Moinuddin Chishti RA, Fariduddin Ganjshakar RA, Bahaduddin Zikriya Multani RA, Nizamuddin Auliya RA, Qutbuddin Bakhtiar Kaki RA, Shah Abdul Latif Bhittai RA, Lal Shahbaz Qalander RA, Bari Imam Shah Abdul Latif Kazmi RA, Shams of Tabriz RA, Rumi RA, Sakhi Sultan Bahoo RA, Mohammad Abdullah Shah RA, Abdul Ghafoor Shah RA, Syed Mohammad Bahadur Ali Shah RA, Syed Mohammad Abdul Aziz RA did not become a shrine caretaker. All of them granted Divine vision and closeness to thousands of seekers of Allah through their spiritual sight and khanqahs. They all made a mark in the history of the spiritual world due to their relationship with Allah. None of them had any inclination or reliability upon any shrine and were not shrine caretakers. On the other hand, those shrine caretakers who pretend to be Fakirs have introduced and wrongly attached things which are not part of Faqr. Such things include wearing colorful rings, dancing bare-foot and sometimes acting so lost that they uncover themselves. These are only heresy to the Mohammadan religion and hence, nor to Faqr. People blindly follow the descendants of a Saint for generations oblivious to the fact that the present descendant does not have the spirituality of that Saint. The descendants make money and trap people to obtain offerings and derive spiritual benefits out of it. Those who oppose spirituality, find it convenient to quote the examples of such people to win their arguments. Another characteristic of fake spiritual guide is that they make a successor (khalifa) out of anyone they personally like instead of following the rule to grant such status after making him go through trial and struggle. Following this rule, the Perfect Fakirs first educate and then train their spiritual heir and junior successor (khalifa-e-asghar). The disciples are first made to experience all sorts of physical and spiritual trials. The way gold is purified after being burnt in kiln. The disciple is also assessed as the Perfect Fakir purifies his innerself and elevates him to grant the status of successor (khalifa). The Perfect Fakir purifies the innerself and purges the inward of his disciples. He does not involve them in recitals or forty day seclusion. He makes a khanqah that trains those are bound by their innserself (nafs) and takes them to closeness of Allah. Sultan-ul-Ashiqeen has made such a khanqah. Khanah Sarwari Qadri is the only khanqah of this time where Unity of Allah is taught. Here, seekers get character transformation as their innerselves are improved and they reach high stations. A lot worldly driven people converted into seekers of Allah through the beneficent company of Sultan-ul-Ashiqeen. Tehreek Dawat-e-Faqr invites everyone to visit Khanqah Sarwari Qadri for the purification of innerself and purgation of inward. You will be rewarded with the invocation (dhikr) and contemplation (tasawur) of the personal name of Allah (Ism-e-Allah Zaat) by Sultan-ul-Ashiqeen Sultan Mohammad Najib-ur-Rehman. This will enable you to achieve the gnosis (marifa) of Allah. Please leave us a comment and hit the like button.